This is a pretty requested recipe, and I'm finally getting around to making a batch, so I hope this answers the numerous questions I've gotten about it. Lardo in Italian means lard or fatback. It's cured in numerous areas of Italy, with the most famous being in Tuscany, where it's known as Lardo di Colonnata. This recipe is a recreation of a lardo style made in Arnad in the Valle D'Aosta region, or at least my rendition of this lardo. The fatback is cured and then sliced thinly and eating as a salume. 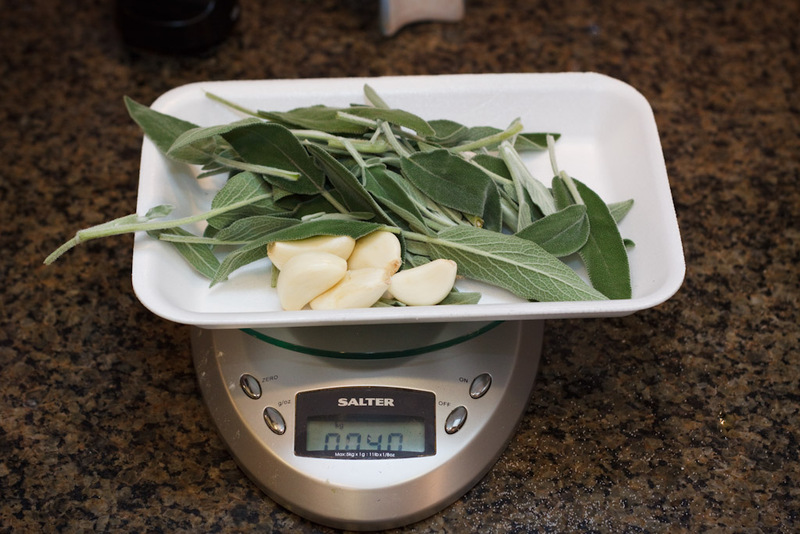 The hardest part of this recipe is procuring a piece of fatback that's thick enough to use. You won't be able to find it at a supermarket, you'll have to source it from your friendly local farmer. The rest is easy. It's just brine cured, not dry cured at all. 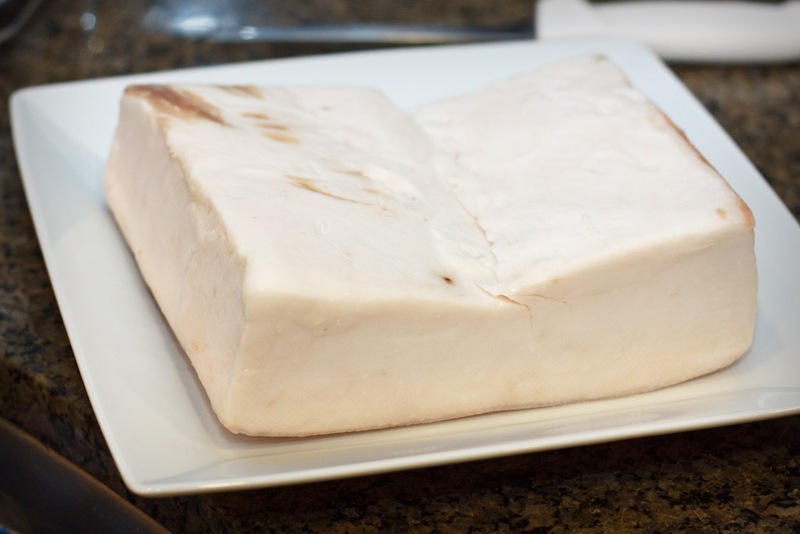 Lardo D'Arnad is traditionally brine cured in large wooden boxes called "doils". Clearly I don't own chestnut wood boxes in which to cure my lardo, so i used a large plastic container. 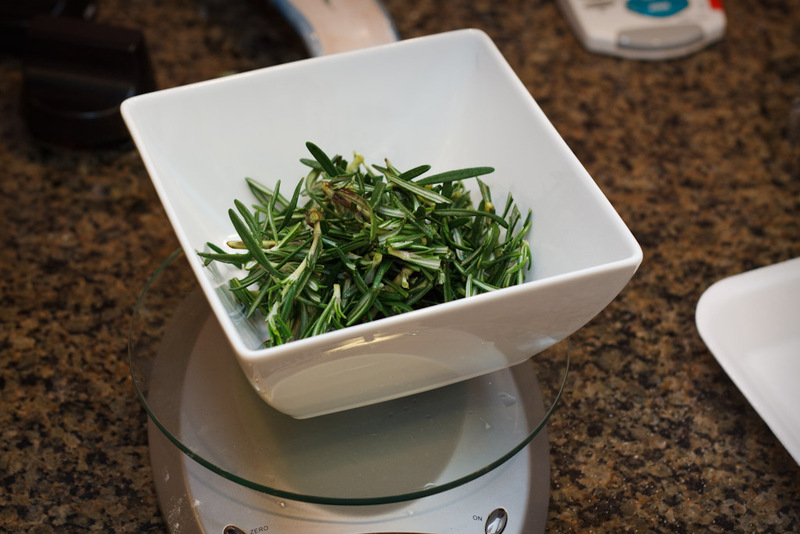 Nice fresh rosemary. It's washed and ready to use. 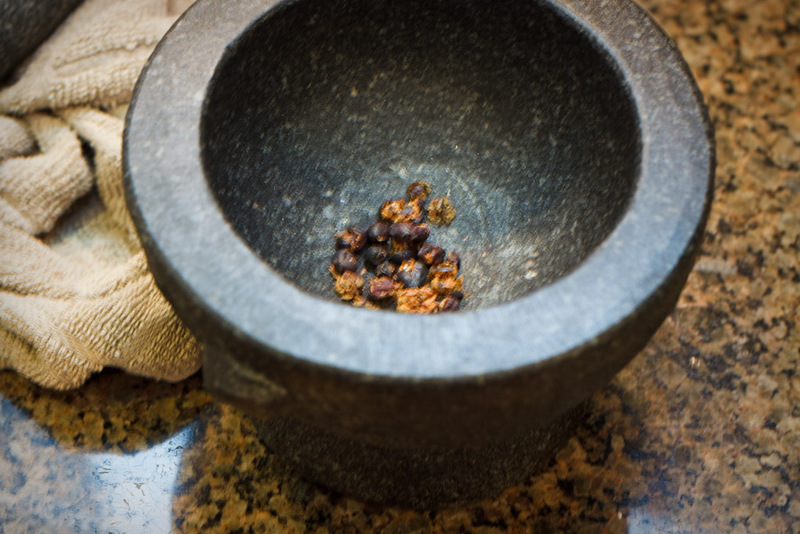 Juniper berries lightly crushed in a mortar and pestle. The water is brought to a boil, the salt is added and all the spices, herbs, and curing salt is dumped in. Turn off the fire and cover. Let cool to room temperature. Basically an herbal, salty tea is made. Here is the brine. Ready to cure the fatback. I want to take a minute to detail how i calculated the amount of curing salts to add. This is actually somewhat complicated and not exactly agreed upon. There is a detailed discussion of brine curing on the sausagemaking.org forum. Parts of the discussion on brine curing can be found here and here. 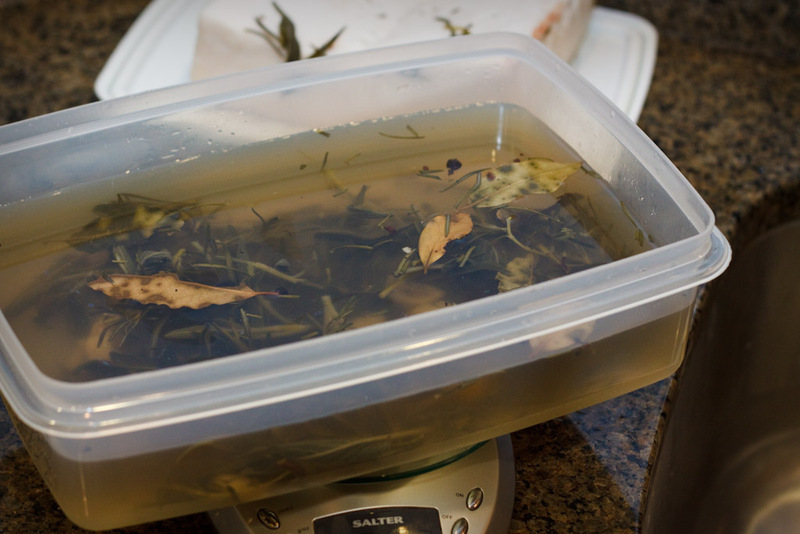 Keep in mind that curing in a brine is different than dry curing. In dry curing, it's pretty safe to assume that the amount of salt you add and curing salts you add, pretty much end up in the meat. With a brine, that wouldn't be correct. There are a few brine curing calculation methods which are detailed by the FDA, I'm assuming an equilibrium method for brine curing, which is detailed in the FDA processing inspectors handbook. Based on all this reading, I decided i wanted the residual parts per million of nitrites to be about 150. I decided on 150PPM as that is the residual nitrite allowed by the European Union, which to be perfectly honest, i trust more than our own FDA, which allows up to 200PPM. To achieve 150PPM, based on experimental analysis by some fellows on Sausagemaking.org, that meant I had to add 175 ppm of nitrites to my brine. 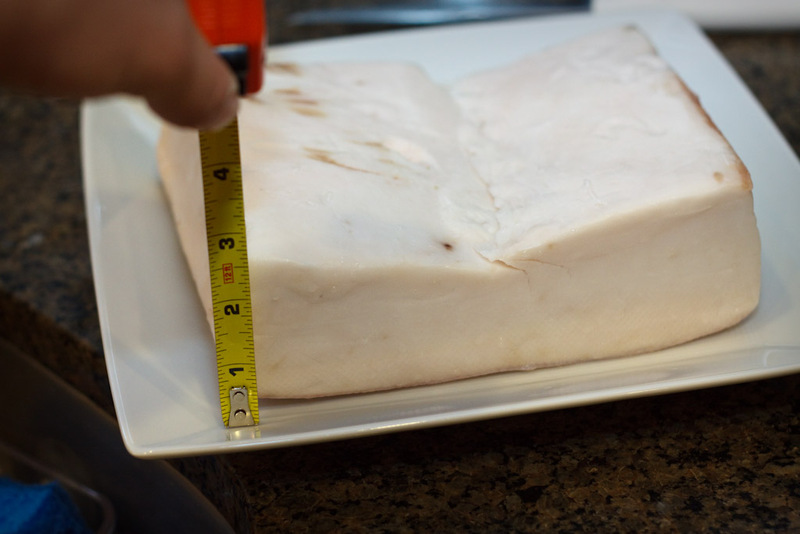 The main discrepancy with my product and the FDA book is that the book assumes a piece of meat, whereas my item is pure fat, which means the uptake may be slightly different. Unfortunately, i have nothing else to go by, so i assume it acted the same as meat. Given the quantity of salt (25% brine), I would actually feel OK about leaving the cure out in this case, but I added it in this instance. So I could use 0.77g of pure sodium nitrite, which i do not have. I have cure #1, which is 6.25% sodium nitrite. That means I would have to use (0.77/0.0625) = 12.3g of cure #1. So that's our math lesson for today. Please take the time to read the FDA processors handbook, as well as the forum posts. There is a very interesting discussion in there. The processors handbook has great examples for the calculations, as well as safety limits for many of the products we use. So here is the piece of fatback that is about to go into the brine. You can see this is no normal piece of fat from a factory pig. This is an Ossabaw fat back from Caw Caw Creek. Attempting this with a piece of fatback that's thinner than 1.5" would be pretty much useless I think. The fatback is put into the brine, and flipped once a month. 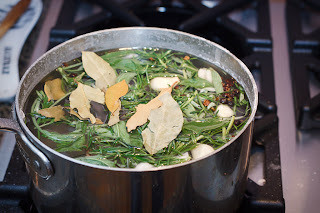 It's left in the brine to equilibrate for a total of about 3 months. Once it's done, it's sliced super thin and eaten with some black pepper and some crusty bread. Wow Jason, I'm envious of that piece of fatback - I've never seen any that thick in the UK. Hey phil, it's really almost unheard of here too. I got lucky with the farmer. Lovely piece of fat. I look forward to your results. Mine should be ready in about a month. And with Serrano Ham pigs as ancestors, the Ossabaw fat can't be terrible. Thanks for the detailed information on the nitrite calculations, and the references to the FDA and EU numbers. I'd trust the EU a bit more on this one, too. Thanks Jennifer. I agree on the Ossabaw. Unfortunately, i've heard Emile @ Caw Caw doesn't raise them anymore...but i haven't actually asked him. I've just started a piece of lardo from a berkshire, which is only about an inch and a half thick.. hazlenut finished so it should be nice. Jason. That looks good. Where in GA did you find the fatback? I also live in GA and would like to get some. steven, i didn't get it in GA. It's from a farm in N. Carolina. Caw Caw Creek. I have reviewed your website mulitple times and wanted to see if you have any insight or recoomendations on where to find recipes for Spanish Cured meats? Serrano Hams, Types of Chorizo and Cantipallo etc. I have been searching for some time and have not been successfull beyond a simple chorizo? Hi Tony, sorry i can't help much. The best recipe site i know of is Len Poli's page. Take a look in my links. See if he has what you're looking for! Now to find a nice, fat pig of my own! Jason - when you flip the fatback (gorgeous btw) did you open the container and flip it or just flip the container? Wondering about introducing contaminants. But I suppose the salinity takes care it. Hey Jason, I found your blog about 2 months ago and now I have become obsessed with this stuff. I just wanted to say thanks for the blog and say dear lord that is some awesome fatback. I'm up here in Bellingham, Wa and I'm just getting to the stage of trying to find farmers to work with. Again thanks! Caw Caw Creek (South Carolina actually) does not raise Ossabaw hogs anymore, I have confirmed that with Emile a few months ago. Too bad really, as this is a species is listed as critical by the American Livestock Breeds Conservancy. Those in the southeast can still find Ossabaw pork though; check out Nature's Harmony Farm. Yup, i also spoke to Emile this week...he said not to worry about the name...his pork is always the best. Ossabaw or something else. Looks awesome. We are raising Ossabaw's in WVA for our Charcuterie project! Crossing them with farmers hybrid & WVA Longnose. Pastured and forest finished in the fall. Try curing the Ossabaw loin with that beautiful fat attached not thats LOMO! thanks Justin. If i can get a nice loin with the fat attached that would be awesome! You ever cook with fatback? Or is it primarily served on fresh bread? BBQ dude, i do cook with fatback, but not much. I mostly have it with fresh bread. Looks great, and I can't wait to try. But I don't have access to fat back that thick...that leads to my question, why do you state it would be pretty much useless with a thinner cut of fatback. Couldn't you adjust the time you cure to achieve the same lardo bliss? Thanks. You could, it would justbe hard to use since the slices would be so thin/narrow...but it would work i guess. I gotcha...that's what I figured. Just wanted to be sure there wasn't a 'taste' issue. Thanks! Love the site. But for this, you don't have to dry the meat? So it basically goes straight from brining to serving? Correct Marc, this goes from brine to table. Hi Jason, just curious but why do you not dry cure and hang it? I'm certainly no expert, but that's always the way I've seen lardo cured. Is this a specific type that is brined, or specific to a certain area? This lardo is specific to the area of Val D'Aosta. It's made in a brine. There are certainly other areas that dry cure instead of brine curing. Well, it's been nearly three months and I couldn't wait any longer. Straight out of the brine, the flavor's excellent. Obviously it needs some drying time to improve the texture, but this is definitely going to be part of the Christmas package to the most special people in my life. Tom, i don't think lardo is traditionally dried because there really isn't any, or much, water to dry out in the fat. Let me know how it changes after drying. Jason, I put a 6 oz piece in at 35F and 55%, and it lost about 1/4 oz (4%) in a couple of days. Not much, but it feels to me like it did tighten up a bit. Seems to me that since salt isn't fat-soluble, it can't transport in unless the piece absorbs a fair amount of water. But it's good either way. David, yes, i use a plate or similar weight. Hi Jason, I made your lardo d'arnad and after about 2 months, my bag broke and leaked out most of the brine.... My piece was thick but not as thick as yours (about 1 inch at thickest) and had a TINY bit of meat on it. Would you think it would be safe to assume that it's ok? 2 months should be long enough...i say go for it. Can you make Lardo without the use of sodium nitrite? 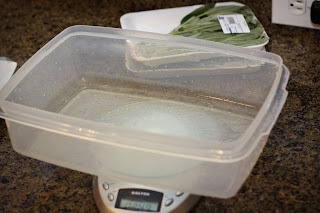 I got a little lazy and skipped on using it for my brine. Will I die if I eat my finished lardo raw since I did not use any pink salt? You SHOULD be fine with just the salt since it's a solid piece of fat, the risk is pretty low. Hi Jason, is there any negative effect to keeping the fat in the brine longer than 3 months? 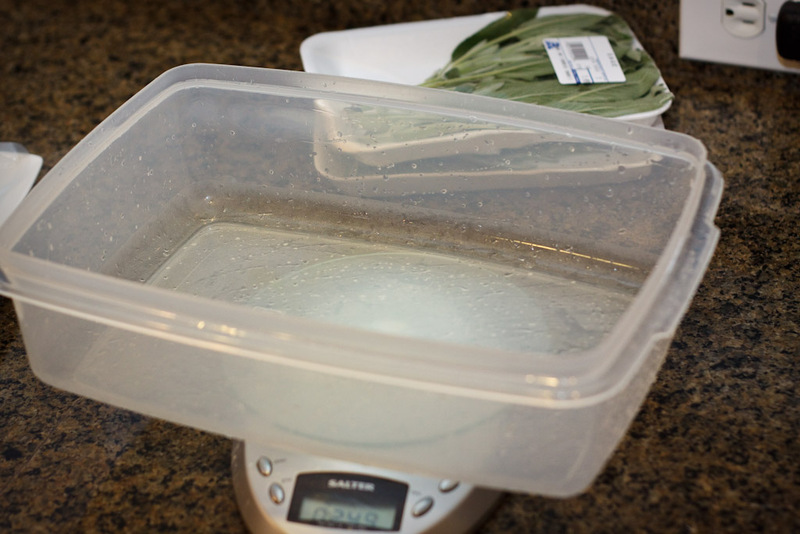 Also, what is the best way to store it once i have completed the brine? should it be served at a certain temp? At this salt concentration i dont see a problem keeping it longer than 3 months in brine, but i don't see a reason to either. You can store it vacuum packed in the fridge. Slice and serve at room temp is best. I'd like to know in what temperature conditions did you keep your brine during the 3 months. Do I need to put it in a fridge?